It's Day 12 of the Advent Calendar! If you have the ability to avoid every single shot heading your way, this tank is for you. 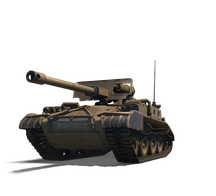 The ability to use stealth to your advantage is having the right to command the M56 Scorpion's awesome gun. This tank destroyer is not for the weak-hearted, but experienced players will find it extremely rewarding in battle.